As cyberwarfare grows in importance, the Air Force's new Cyber Command could become a magnet for funding, resources and capabilities. The Air Force announced in November it would create the Cyber Command, to be headquartered at the 8th Air Force at Barksdale Air Force Base, La., and named Lt. Gen. Robert Elder the new organization's first chief. According to Air Force budget documents released Feb. 5, the command will formally begin operations in May and be fully operational by October 2009. The Cyber Command plans to move beyond the idea of cyberspace 'as network operations, information operations or use of the Internet as an enabler for military operations in physical domains,' Elder said. 'The Air Force now recognizes that cyberspace ops is a potential center of gravity for the United States and, much like air and space superiority, cyberspace superiority is a prerequisite for effective operations in all warfighting domains,' Elder said. The Cyber Command also will work closely with other government agencies in support of the Joint Task Force-Global Network Operations, part of the U.S. Strategic Command, he said. The just-released fiscal 2008 budget proposal doesn't provide many clues to how much funding the new command will receive. Budget documents are notoriously difficult to decipher, but, she pointed out, there is an increase of $300 million proposed for 'communications,' some of which could be spent on cyberactivities. In the long term, experts believe, the Cyber Command is designed to build capabilities for cyberactivities that could extend well beyond the Air Force. 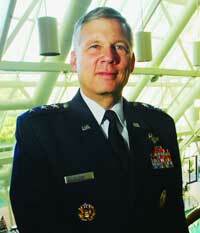 The Cyber Command 'clearly provides a focal point for dollars,' agreed retired Lt. Gen. Lansford E. Trapp Jr., now vice president of the Air Force sector at Burdeshaw Associates, a defense consultancy in Bethesda, Md. But Mackenzie Eaglen, a senior policy analyst at the Heritage Foundation, cautioned that, in an era of budgetary constraints, 'it is an open question how the Cyber Command will compete for resources.' Potential rivals for available funding could include the administration's missile defense initiative, she said. Those capabilities are likely to be threefold, according to Peter Swire, a law professor at Ohio State University and a senior fellow at the Center for American Progress in Washington. The first involves defending cybersystems and preventing an enemy from disrupting communications. The second involves gathering intelligence on adversaries' cyberactivities. The third and most controversial aspect of cyberwarfare contemplates the possibility of U.S. forces taking the offensive by conducting hacking attacks against enemy systems. Offensive cyberoperations could entangle the military in a legal snare, according to Swire. Some of the activities could violate the Geneva Conventions, he said, because actors usually hide their identities. The successful concentration of funding and capabilities in the Cyber Command also could promote that unit as the center for Defense-wide cyberwarfare operations.